As you can see, it is way more empty than when we started. We only have a few winter vegetables. However, we still have a few Chinese cabbages and a few broccoli plants. These will not live through winter. We are going to pick them soon but they are not very big. 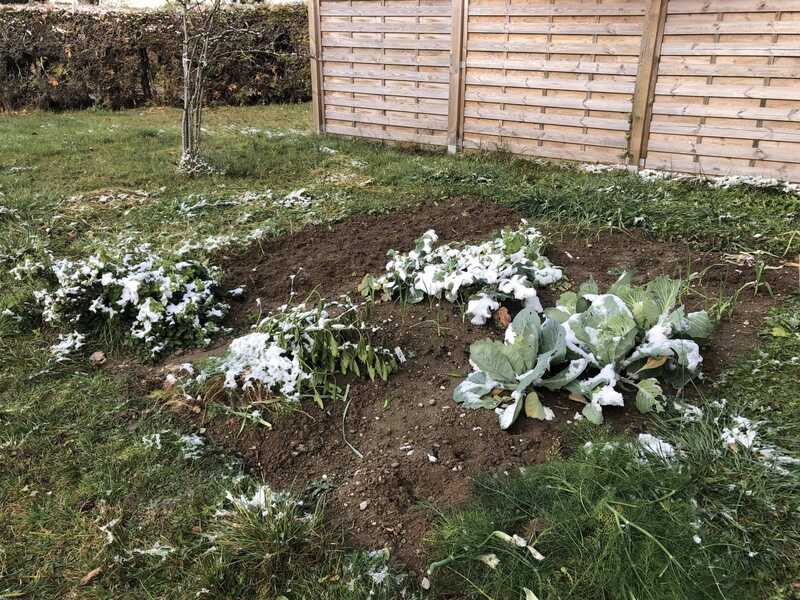 The garlic should normally survive Swiss winters. And as for the cabbage, it is special winter cabbage, so it should be fine. We will know at the return of the nice days. It was really a great experience for us to start our own vegetable garden. Even if not everything went well, it was enjoyable. And it was so good to have fresh vegetables out of our garden. Our garden is still very small. So we had to buy some vegetables too. But we still had some very nice returns. With more experience and a bigger garden, we will be able to get more vegetables next year! Overall, it is really not too bad! Some of the plants really gave a lot of vegetables. We had much more zucchini than we expected. And we did not think eggplants could grow that well in Switzerland. We also have to remember that we had an incredibly hot summer and autumn. There was a lot of sun and the beginning of the autumn also was nice and things continued to grow. Next year may not be that great in terms of weather. But that is all right! 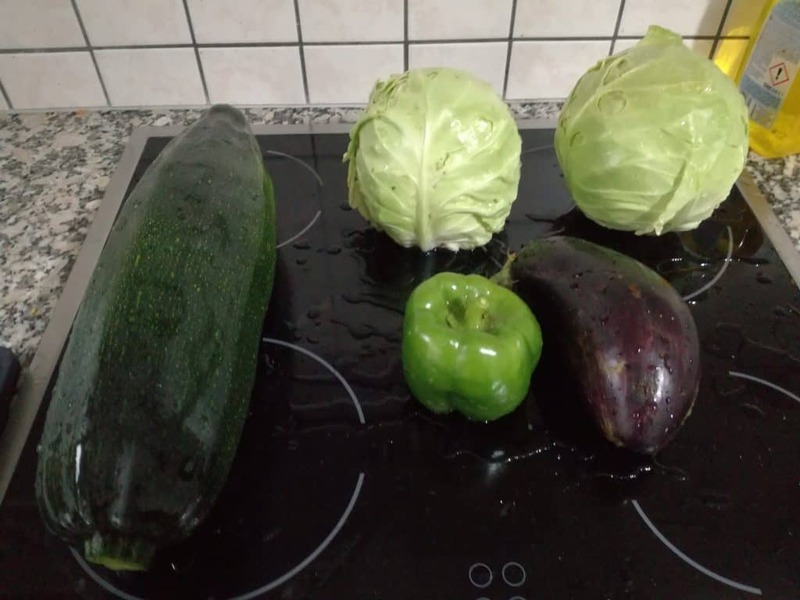 A few of our vegetables did not grow at all. For instance, none of the garlic seeds gave anything. We planted some more garlic at the end of Autumn. We will see how they are going when Spring comes back. And a lot of onions did not grow either. In the end, the onions stayed very small. It may come from our soil that is not very good yet or the lack of sun. The red cabbage did not grow a lot compared to other gardens this year. I think that our soil was not fertilized enough. In total, the vegetables from this year in our garden cost us 71.40 CHF. In total, the vegetables from this year would have cost us 123 CHF had we bought them in our general shops. This is an estimation of course since we did not weight every single vegetable ;) I took the price for the non-organic food. Because this is what we generally buy. However, the vegetables from our garden are organic so that is one more advantage! We made a profit of more than 50 CHF with our garden! This is pretty great for the first year. I was honestly thinking we would not have made a profit this year. As I mentioned in another post, a vegetable garden is one of the ways to save money on your food budget. We should have found a good way to keep the insects away from our plants. We used some products for ants. It was very expensive and not very effective. Finally, we burned down the big nests of ants with boiling water. This worked quite well since we almost had no more ants. But this did not prevent other insects to lay waste to some of our vegetables. For next year, we need to do something against slugs and some insects. We will see what we do. Another thing is that we were not careful enough with some of the plants. For instance, we let some of the zucchini become too big. They are stronger to eat when they get too big. It is not as good. We also let a few salads go up too much before taking them. Next year, we should definitely watch over our garden more seriously. We should have grown some vegetables that produce a lot instead of some that produce very little. For instance, we got only very few peas from our peas plants. Next year, we are planning to plant green runner beans. They produce a lot and do not use a lot of space on the ground since they grow up. Another thing is that we should not have planted some plants. For instance, I planted some basil out of habit because my father always planted some. But we do not really know what to do with it! Next year, we will focus on plants we use to optimize the room for more efficiency. We did not fertilize enough the soil in my opinion. We only used some fertilizer from the shop. Either we should have used more fertilizer. Or we should have directly used a greater quantity of manure in the soil when we turned it. My father always used manure for this. I think that is what we are going to do next year. I am going to see if I can find cheap manure at one of our local farmers. Finally, our timing was not great. We started a bit late in the season. It took us longer than we expected to get started. We should have planted the seeds and seedlings at least two weeks earlier. And we planted the last seeds too late. The fennels and broccoli that we planted after we had more room in the garden did not have enough time to grow. Next year, we are definitely going to try to plant earlier. In total, our garden made us a profit of 50 CHF in one year! And it gave us excellent organic vegetables during the harvest season. We are really happy with the result. I was not expecting a profit from our garden this year honestly. It was a lot of work but we enjoyed it a lot. And we learned a lot during this year. We did many things wrong. But we are learning from our mistakes and we will not make them again next year. But I am pretty sure that we are going to make new mistakes next year! Next year, we will probably still be in the same apartment. So we will still do the same garden. We plan to make it slightly bigger, but not a lot. Probably about thirty percent bigger. On the other hand, we are going to work on improving what we did wrong this year. I hope we are going to get better at it every ear :) Once we move to a bigger house, we are going to check for the possibility to have a garden too. Do you have any gardening tips for us? Do you have a vegetable garden at your house? We also have our garden. irrigation and our work than result is negative. But main and only motive for having garden is healthy organic food for our family. Yes, once you factor in the costs of your own time especially, it gets quite crazy. It is not really worth your time as a side hustle. Water is pretty cheap in Switzerland and we didn’t irrigate much. I had a garden in the latest several years (rented to our commune) – I still have no confirmation for this year so it might be history…. – perennial plants – buy once, harvest forever: kale, mint, some leaf plants, etc. – follow plants that I harvest several times. Zucchini, small cucumbers, green beans. For zucchini and green beans I frozen so I didn’t buy a part of winter. One cabbage can be harvest once, but kale I am harvesting for 3 years already, several leaves each time. -condiments here are f***ing expensive. I am not joking, some are 40-50 euro per kg…so I plant ill, parsley, celery, mint, cilandro etc. try a small pot to buy and spread it. Wow, you really take gardening seriously! That’s pretty nice! We are doing compost as well, but not at home, at my father’s home. This spring, we plan to use free compost for the garden. We do not use a lot of condiments, so I do not think we would save a lot on that one. In fact, we planted a few and we almost did not use them. I never tried to make seeds myself but that’s a great idea! I will also think about perennial plants this year. Thanks a lot for your advices! Good luck with your garden this year once the season starts! We are probably going to increase the size of our garden a bit this year. But we are waiting to have a house for long-term gardening. Next Next post: November 2018 – Brussels and too much shopping!